I like to cook intuitively with what happens to be on hand, which means having a certain familiarity with my ingredients. Recipes are just guidelines in my world and not to be taken at face value, ever. I’ve never had enough Saffron around to become familiar with it to the point that I can use it with any confidence. 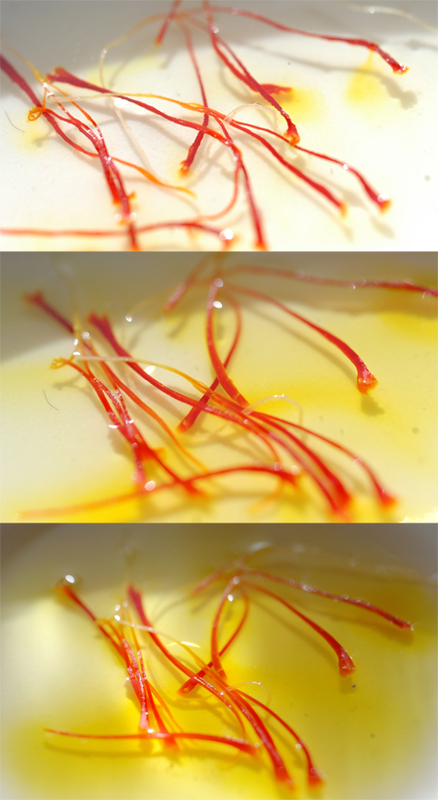 When my mom brought me a small box of quality saffron from Spain, I had a chance to become a little more familiar. With Saffron now on my radar, I of course decided I should grow the stuff instead of buying it. I mean if we can grow the stuff here, why import it at 80.00 an ounce? 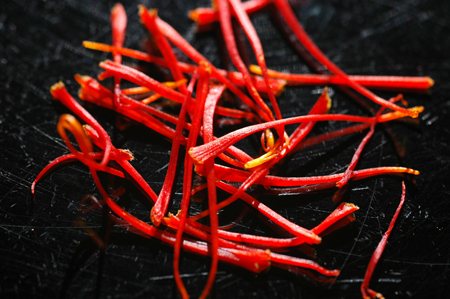 Saffron seems to be capable of growing in a fairly wide variety of climates from England to Afghanistan. Then I could sell the bulbs and promote the idea of growing it and start a local industry and…..
Re-soaking saffron threads for use in cooking. Crocus carwrightianus is probably the parent of the Saffron Crocus, and is a normal seed producing plant that exists in wild seed propagated populations. Crocus sativus on the other hand is a mutation or hybrid of some type, and it never produces seed, but can only be grown and propagated by redistribution of the underground parts. So, Saffron Crocus is probably entirely dependent on humans for it’s survival and propagation. Although the stigma of Crocus cartwrightianus can also be used to make saffron, it is almost exclusively made from Crocus sativus. All of the sources I can find indicate that the Saffron crocus has either more or better flavor than C cartwrightianus, and/or that C Sativus produces more Saffron per plant due to heavier Stigmas. Regardless, I’m interested in picking up some cartwrightianus to play with. Cartwrightianus, now there’s a clunky name that I can never remember. I guess if I discovered it I could name it Edholmianus. I’m not sure I like it, and it sounds pretty dirty. Freshly harvested saffron threads. Only freshly opened flowers are used. It is necessary to revisit the plants nearly every day for a week or two, since the flowers don’t emerge and open all at once.